MRSA stands for methicillin-resistant Staphylococcus aureus (S. aureus) bacteria. This organism is known for causing skin infections in addition to many other types of infections. There are other designations in the scientific literature for these bacteria according to where the bacteria are acquired by patients, such as community-acquired MRSA (CA-MRSA), hospital-acquired or health-care-acquired MRSA (HA-MRSA), or epidemic MRSA (EMRSA). A number of Web and popular press articles are titled or include the erroneous term “MRSA virus.” This is a misnomer; there is no contagious MRSA virus. Staph bacteria are normally found on the skin or in the nose of about one-third of the population. If you have staph on your skin or in your nose but aren’t sick, you are said to be “colonized” but not infected. Healthy people can be colonized and have no ill effects. However, they can pass the germ to others. Staph bacteria are generally harmless unless they enter the body through a cut or other wound, and even then they often cause only minor skin problems in healthy people. 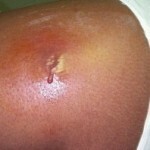 However, staph infections can cause serious illness. This most often happens in older adults and people who have weakened immune systems, usually in hospitals and long term care facilities. But in the past several years, serious infections have been occurring in otherwise healthy people in the community, for example athletes who share equipment or personal items. Unnecessary antibiotic use– Like other superbugs, MRSA is the result of decades of excessive and unnecessary antibiotic use. For years, antibiotics have been prescribed for colds, flu and other viral infections that don’t respond to these drugs, as well as for simple bacterial infections that normally clear on their own. Antibiotics in food and water– Prescription drugs aren’t the only source of antibiotics. In the United States, antibiotics can be found in livestock. These antibiotics find their way into municipal water systems when the runoff from feedlots contaminates streams and groundwater. Germ mutation– Even when antibiotics are used appropriately, they contribute to the rise of drug-resistant bacteria because they don’t destroy every germ they target. Bacteria live on an evolutionary fast track, so germs that survive treatment with one antibiotic soon learn to resist others. Furthermore bacteria mutate much more quickly than new drugs can be produced, some germs end up resistant to just about everything. That’s why only a handful of drugs are now effective against most forms of staph. In 2009, research showed that many antibiotic-resistant genes and toxins are bundled and transferred together to other bacteria, which speed the development of toxic and resistant strains of MRSA. S. aureus is sometimes termed a “superbug” because of its ability to become resistant to several antibiotics.